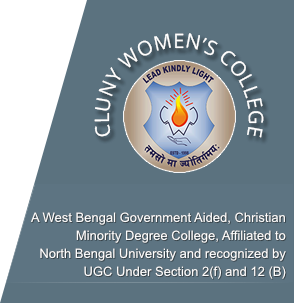 Cluny Women’s College is a West Bengal Government Aided, Christian Minority Degree College Affiliated to North Bengal University and recognized by UGC Under Section 2(f) and 12 (B). The College was established by the Registered Society of the Sisters of St. Joseph of Cluny in 1998. The aim of the College is to give Education up to the highest University standard, which would include the imparting of sound learning, the building of character and the spread of spiritual truth and knowledge of God. Students on their part are expected to do their best to attain that harmonious development which will make them worthy citizens of a great nation sincerely committed to God, home and country. Cluny Women’s College has a sprawling campus including open grounds, one three-story building, a Students’ Residence within the campus, a spacious multipurpose hall and a well-endowed library with over 10,000 books. Name of the College: Cluny Women's College. Address: 8th Mile. P.O. Kalimpong, Dist. Kalimpong.